Beyond its utility in replicating the interior of a building convincingly, the architectural set attracted film-makers who held that cinema allowed an entirely new kind of story-telling. In Weimar Berlin, Hans Janowitz and Carl Mayer each drew on disturbing personal incidents to write The Cabinet of Dr Caligari, and believed that a fully visual filmic experience was necessary to recreate this for the audience. Their producer had little money but a theatrical background, and so turned to painter friends Walter Reimann and Walter Röhrig and director Robert Wiene to make a film that would deploy backdrops and sets with dramatic angles, deliberately distorted perspectives and painted light effects to evoke an unsettled mental state in the viewer’s mind. 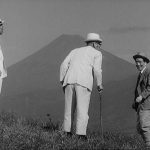 Reflecting a wider move toward non-objective concepts in art, this Expressionist approach proved highly successful, informing other films such as F.W. Murnau’s still-disturbing Nosferatu. 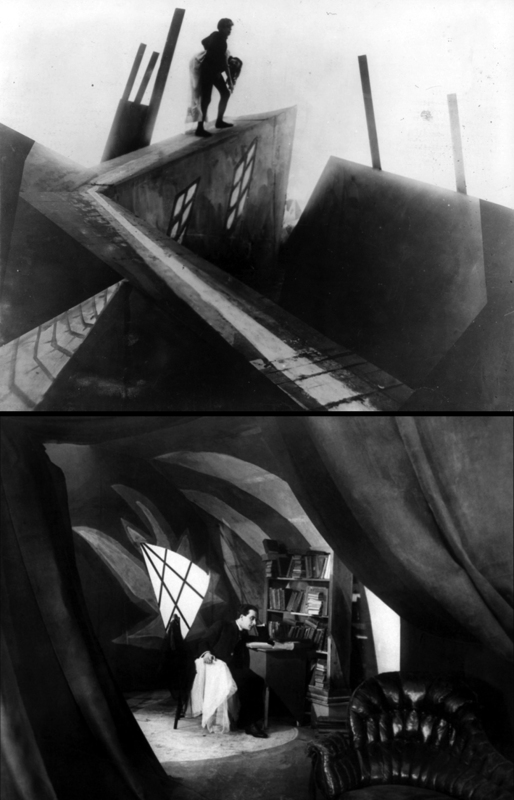 Though Expressionist cinema was short-lived and confined to Germany (only hints of the style are detectable in Fritz Lang’s Metropolis, made just a few years later), the principle of a set design intended to induce a psychological response rather than reproduce a particular place has endured. Filmed almost entirely on sound stages, the imaginative sets for Francis Ford Coppola’s Bram Stoker’s Dracula range from the exaggerated Piranesian gloom of Carfax asylum, seemingly hewn from solid rock, through Dracula’s castle, its silhouette copied from Frantisek Kupka’s famous 1903 painting The Black Idol (Resistance), to the Westenras’ country seat of Hillingham, whose family vault is modelled after tombs in Highgate cemetery. Wider sources for the rich, heightened visuals included Symbolist artists such as Friedrich and Klimt, who explored the unconscious in often-hallucinatory artworks. John Boorman often shoots the natural world sympathetically. He maintained this approach for much of Excalibur, filming at various locations in Ireland including the magnificent waterfall on the Powerscourt estate, whose house will feature in a forthcoming Beyond the Frame. 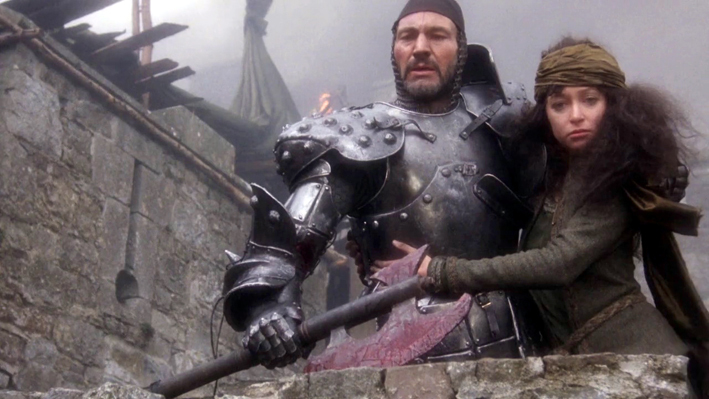 But Boorman also represented his fantastical version of England in the Dark Ages through highly stylised sets. The magical artificiality of Camelot’s architecture is emphasised through walls of shimmering gold and silver, gilded dragons and a hall with its ‘Celtic Deco’ Round Table, in contrast to the lush countryside with which King Arthur is intimately – albeit unwittingly – connected. Appropriately, the wizard Merlin’s cavern deep in the bowels of the Earth, with its colourful melting surfaces and glassy transparency, blurs the boundaries between these two worlds. 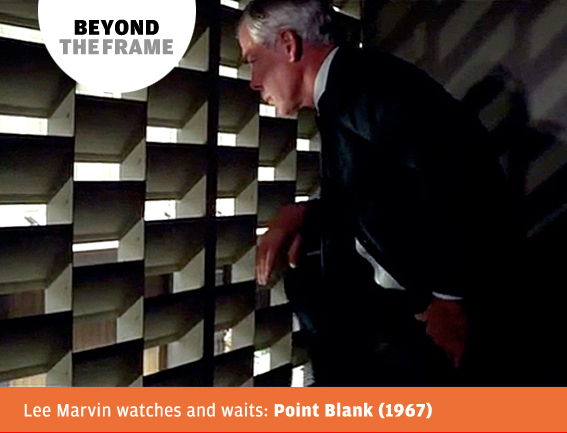 Boorman’s work on Point Blank saw him take a lean and visceral genre novel by Donald Westlake and transform it into a psychological, almost mystical existential piece. The driven and violent Walker blazes through a series of interiors – hotels, offices, houses – whose very blandness highlights his elemental nature. Most of these scenes are colour coded, with clothes, wall coverings, furnishings and lighting carefully aligned to a different hue for each. 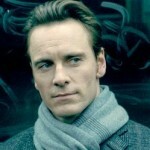 The film becomes a visual fugue, mirroring the uncertain nature of Walker himself – is he alive, dead, angel, devil? 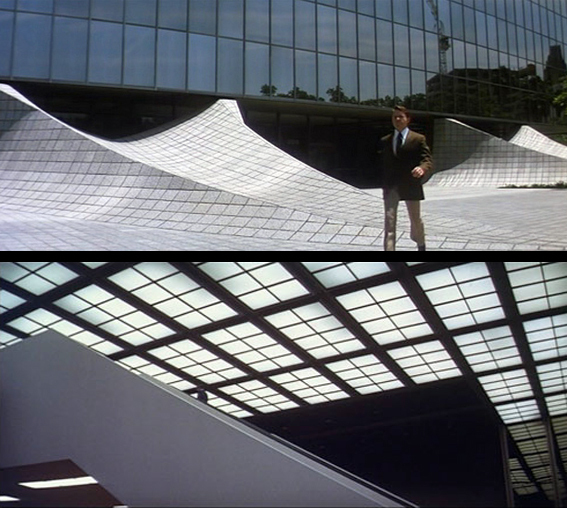 Such ambiguity is confirmed in Alan J. Pakula’s The Parallax View, in which the corporate anonymity of office blocks, airports and lobbies becomes a world of mirrors in which Warren Beatty is reflected, refracted and ultimately trapped, unable to tell the real from the unreal.